If #TBT is only every Thrusdays, Bigg's Diner has a #BTB every day, all day, all the time. 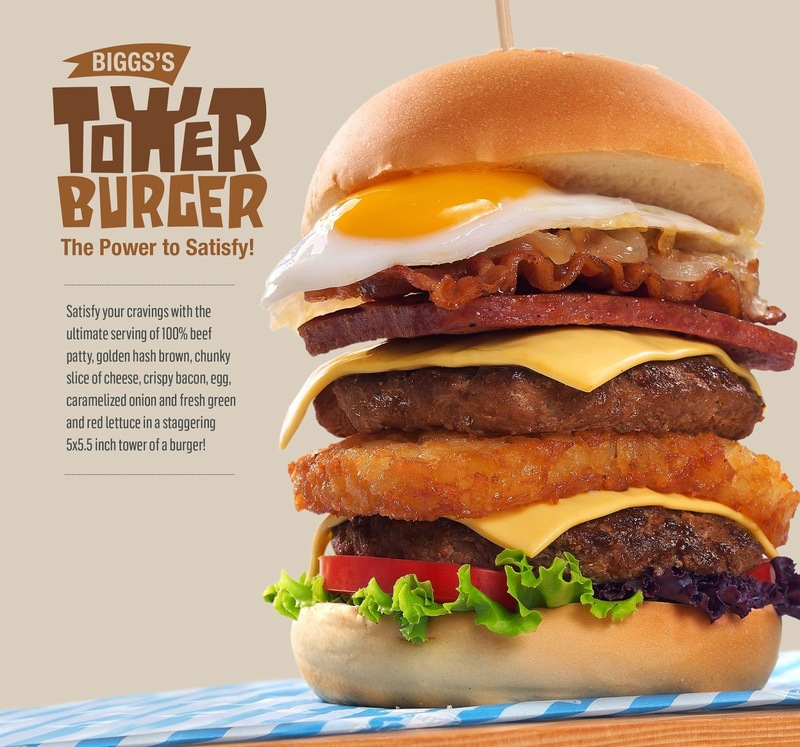 #BTB stands for Bigg's Tower Burger. 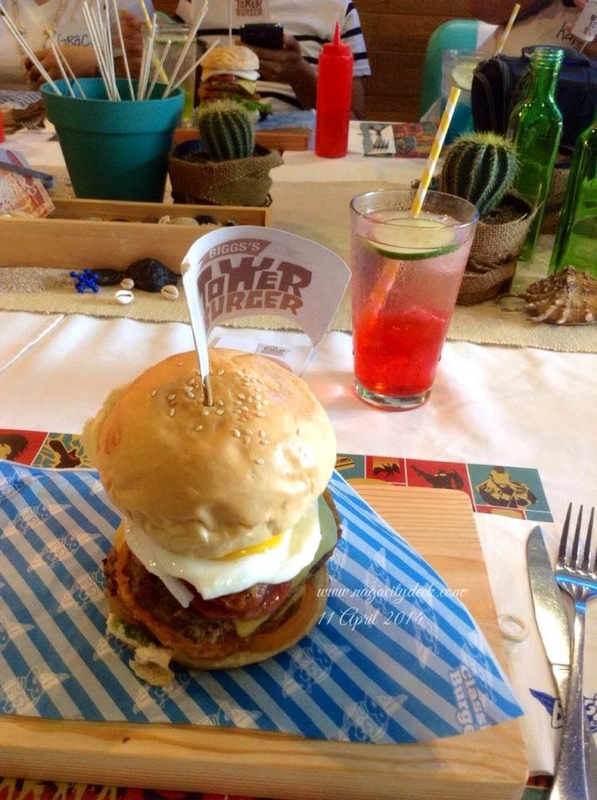 It is not just an ordinary burger because it's the newest, biggest and tallest burger of Bigg's Diner or perhaps than any other stores in the Bicol Region. Eating the BTB was also a courageous move on my part, because I am someone who has a small compartment in my tummy. Nevertheless, the challenge was on. 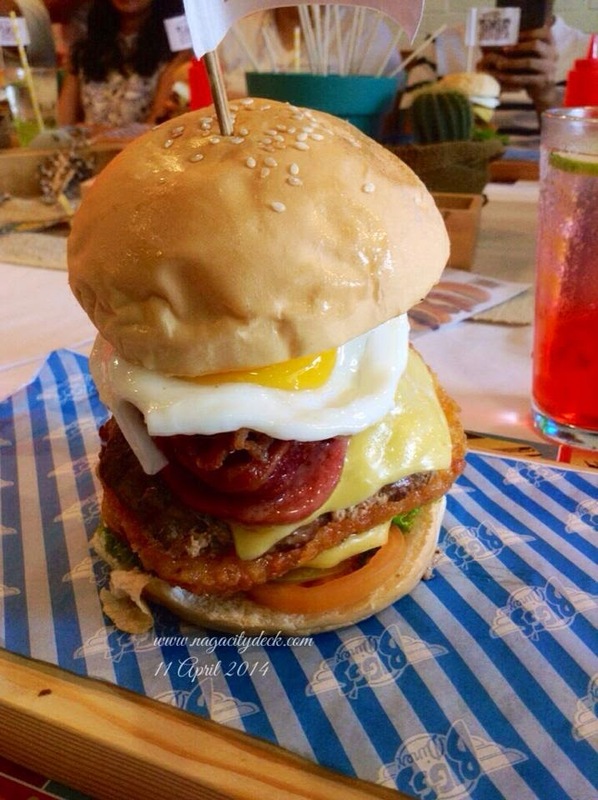 Looking at the burger, the BTB is already good for two people but of course it can be consumed by only one. 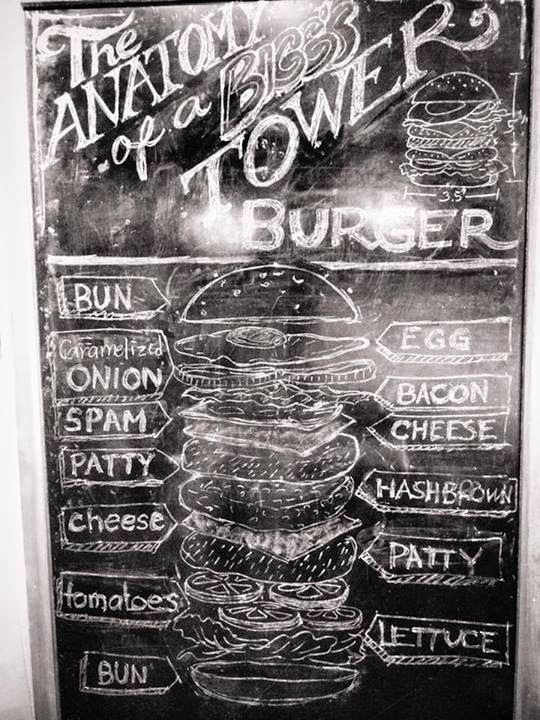 Now what are in between those burger buns, take a look at the anatomy of the burger doodled by Pen Pestrado. The burger is actually like a talking protein right in front of you so let's look into scenario on how to consume this burger. Scenario 1: You're not that hungry but you want to eat a full meal. You will need a little mind conditioning on this. Consider the BTB as two or three viands and not us one large serving. Slice the burger in two and lay the ingredients down. Chunk down the idea that it's too big and too many like how you chunk the ingredients down piece by piece. Do whatever you're comfortable with. Oh btw, you can ask for a plate just in case the space of the board is not enough for you. Take your time in eating do not hasten up. Do not drink too much liquid or else you'll get easily stuffed. Scenario 2: Go to any Bigg's Diner outlet HUNGRY. As in SUPER HUNGRY. Consuming the burger on your own will never be problem. Scenario 3: Bring a date. Eat out with your family or friends. 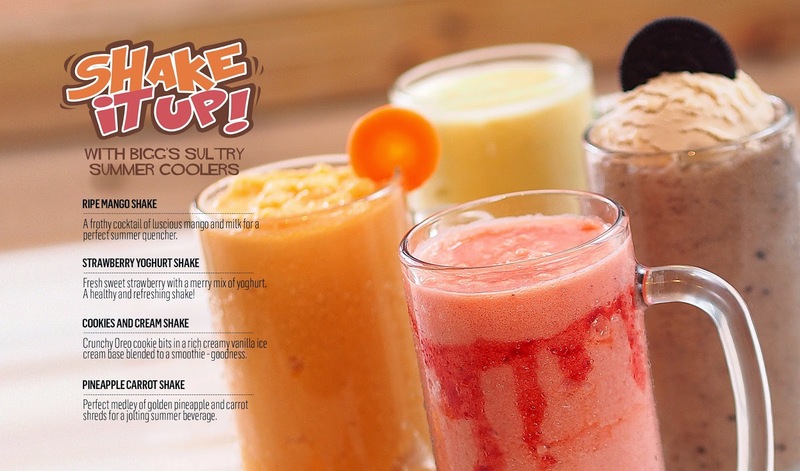 Share the BTB if you're not sure you can consume it all. The patties and the rest of the meat are not overpowering, not too salty and not too blunt. The garlic mayonnaise is a perfect dressing or you can also opt to use the mustard which also perfectly blend with the taste of the ingredients. Forget the calories for a while because as a Bicolano you must be able to experience the flagship of the Bigger Better Bigg's. Introducing the Mello Jello in funky flavors of summer. Cool and groovy name and refreshing colors to the eye. The straws are even environment friendly, they're paper straws. 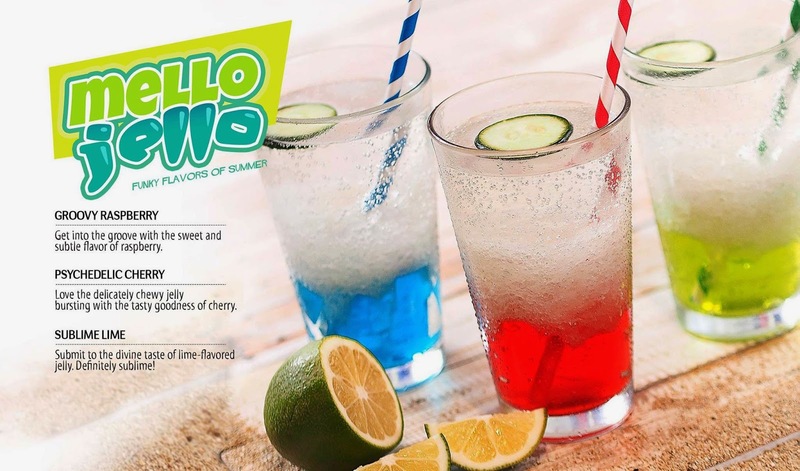 The Mello Jello is comparable to an Italian Soda but with a jello on the bottom. Also available are the Bigg's Sultry Summer Coolers available in four flavors. But wait, there's more! 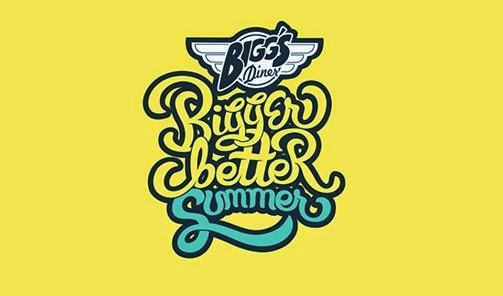 Your summer will be bigger and better with Bigg's because of this.. 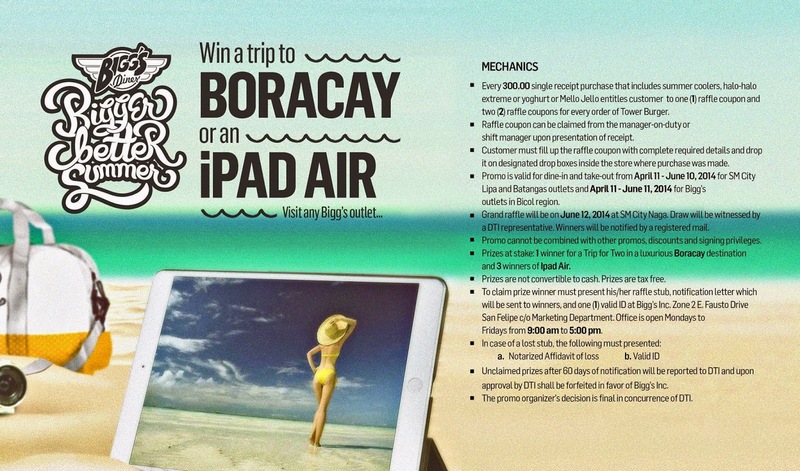 So what are you waiting for, head on to any Bigg's Diner outlet and try the new goodies starting April 15. It's payday!! =D. 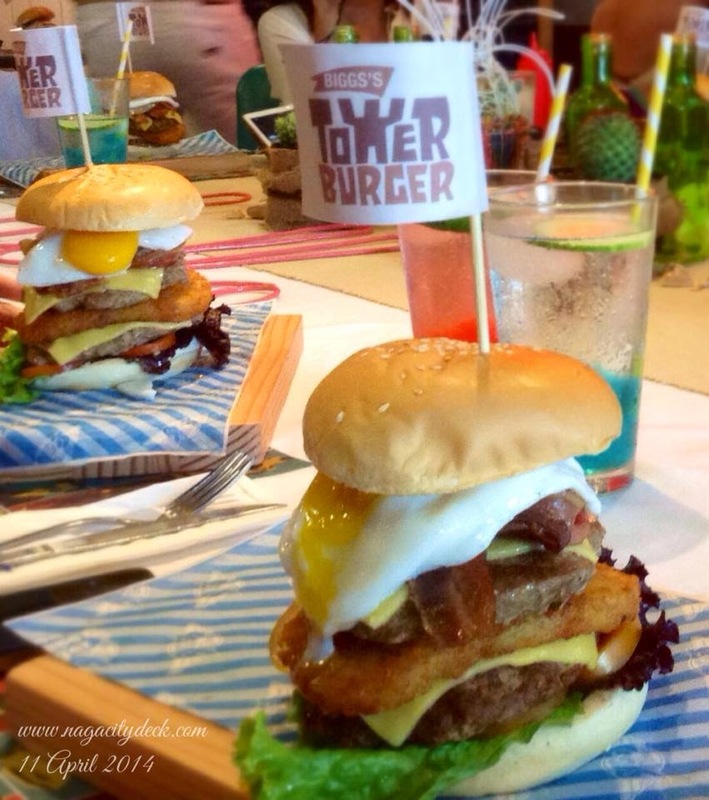 Our next post is a throwback Thursday post dedicated to the first "Biggest" burger in Naga City before the Bigg's Tower Burger, the Whatta Burger. Naguenos, does it ring a bell? CLICK HERE to read more. Thank you so much to the very enthusiastic and awesome couple Sir Carlo and Ma'am Rica Buenaflor and to the marketing team of Bigg's Diner. The initiative to gather up Bicolano bloggers in one room was something I was really looking forward to after so many years in blogging. I have been always envious with fellow Bicolano bloggers based in Manila whenever they have bloggers' events and the like. But now? I can say that we are on the right track. Hats off as well to my new friends, my fellow Bicolano bloggers. I'm so glad to be with people who talks the same language as mine. High five for Bigg's Diner for making the move here in Naga and Bicol! You have lived up to the previous program that you also initiated, truly the Best of Bicol #BoB. Dios Mabalos po!